Synopsis: Unemployed and newly-divorced Stephanie Plum lands a job at her cousin’s bail-bond business, where her first assignment puts her on the trail of a wanted local cop from her romantic past. Review: Well, Heigl is absolutely on a roll. 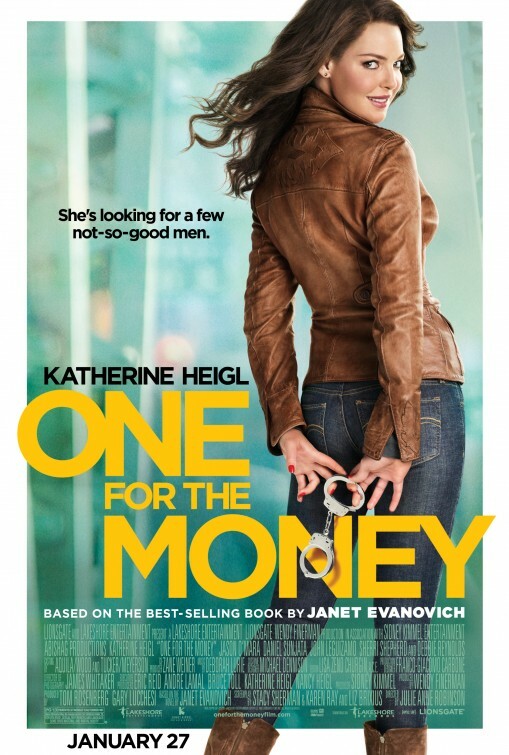 With the delayed release of One for the Money, she’s 5 for 5 when it comes to bad movies she has headlined. New Year’s Eve, Killers, Life as We Know It, and The Ugly Truth were stinkers and Heigl has effectively ix-nayed her movie star status that was hinted at with Knocked Up. I feel that her problem is that she doesn’t realize she’s playing the wrong kind of characters. I don’t see her as the romantic/comedic lead that she seems desperate to mold herself into. She’s not the Julia Roberts character in Pretty Woman…she’s the saleslady that doesn’t let her shop on Rodeo Drive. This failure to recognize her niche is on full display as she takes on Stephanie Plum, the popular central character in Janet Evanonvich’s series of novels following unlikely bounty hunter Plum as she finds herself in increasingly dangerous situations. The books are fun and frothy with an abundance of wink-wink/nudge-nudge style that has made them so successful. Capturing that onscreen evades nearly everything and everyone that is on display in the adaptation of Plum’s first outing. The worst part is, I think a successful movie could have been made of the novel but it probably would have worked even better on the small screen. Perhaps Heigl should have parlayed her star status into creating a great television vehicle for herself but instead she shoots for the moon and hits a weeping willow. The movie is so light that it nearly floats away. From the Bond meets First Wives Club style opening credits the film tries so hard to get the tone of the book that it ends up feeling cartoonish. Heigl’s barely there Jersey accent is only available when it has the chance to get a laugh and it’s especially out of place while hanging out with her family who lay the accent on thick. She’s supported in the film by a lot of familiar faces that get lost in the shuffle. Debra Monk has a few nice scenes as Plum’s mom and Reynolds shows up for a bit but is soon totally forgotten. I wouldn’t doubt that she had more in the film but was cut so as not to further upstage the leading lady. Thankfully, Shepherd and Ryan Michelle Bathe get enough screen time as a pair of sassy hookers so the audience at least gets to experience a few smiles/laughs…but they too vanish in a hurry. Leading man O’Mara has been good on the small screen in the little seen Life on Mars and there is some chemistry between he and Heigl but their wordplay never really lands. The more I think about this the more I see what potential this could have had as a series. Nearly everyone involved in the movie from director Robinson to Heigl to the screenwriters have all come from TVLand and it shows in the product they have given us. If only they didn’t dream quite so big we may have had a breezy series that could service the talents of all involved. It’s a wasted effort that might make for a good rental but is best to avoid plunking down money (or Groupons) for. Hey, have you voted in the new poll?